I nearly checked myself into the Spring Shadows Glen last month over my daughter's new habit of removing her diaper while in bed. It was bad, y'all. Real bad. Okay, back to Annabeth. Y'all, she would not leave her diaper on to save her life, much less my sanity. Thank our God of mercy that we never had a finger painting on the walls with you know what incident. 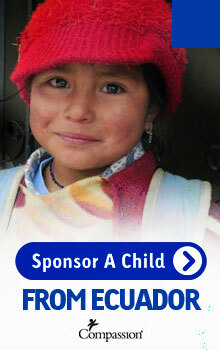 But in a span of five days she soaked her sheets and all her blankets four times. I was on the brink! I'd heard of the duct tape solution and, y'all, I truly did not want to try it. It seemed wrong. But I was moments away from the Spring Shadows Glen and I had no other options. The duct tape belt, however medieval looking, proved to be very effective. But I hated it. I mentioned our problem on the day I began my blog revival. The Lord heard my cries and a company called EscapeeJays found my post. They offered to send Annabeth some free escape-proof pajamas to try. Score! The zipper goes up the back. They're terribly cute, I'm afraid. Adorbs, as my friend Molly Piper says. One look at my little wannabe escapee in her jailbird PJ's made the pain of her diaper rebellion flee. The best news is that these jammies work. When she wears them I have absolutely no dread about what I'm going to find in the morning. Will she have soaked the bed? Nope. Will she have figured out how to take off the duct tape? Duct tape no longer needed! Will she have done the magical "diaper is still on and dry but the bed is soaked" number? Impossible! This is a victory, people. If you have a little diaper escapee who wants to be nekked as a jaybird, I think EscapeeJays are a really great, practical solution. You can find them here. P.S. We have the purple ones too and they are also adorbs. They are adorable and much preferred (I'm sure) to the alternative. I just wish they had been around when my girl was that age! What a great idea they are. I can so relate. I had two boys and one girl that used to do the same thing. With my oldest I had resorted to the packing tape. With the two younger kiddos, I cut the feet off of footed pajamas and put them on backwards. Glad you found something that helps! I'm going to keep those in mind if this happens to become an issue with our youngest! My oldest son (who is about 6 months older than Jackson) was terrible about this! However we did not escape the finger painting with you know what... I lost count of the number of times I had to clean up #2 in his crib and bedroom. It was a nightmare! PTL at around 2 and a half we potty trained him and he didn't do it again! I wish I had known about those PJ's when he was little. We would have bought stock in them! Annabeth looks super cute in her new pajamas! Oh, they ARE cute. She would make anything cute, though. I was blessed by the wall finger painting by both of my girls. Yuck! Oh my goodness, those are precious pjs! And I have to say that my mother may have said the very same thing about Spring Shadows Glen back in the day. We would always drive by it and think it would be fun to go visit there, but then we found out what it really was! hee lar i ous. It's like a really cute diaper prison! ha! Who knew?? How fun they sent you some ... and even better that they're working! The diaper escape is my worst fear. Oh my word. I was just telling Debra we were late meeting her and Jude for lunch today because Ava pulled hers off....can you say a poopy mess? Oh yes! I think it is time for potty training! I AM NOT ready for this, Lord help! Love the jammies! I just had to comment because when my twins were Annabeth's age they did this all the time and we did have the finger painting incident...more than once! They painted each other and everything else they could touch. Gross! So glad you avoided that. And I love the nice name of the mental facility you mentioned, I'm just always telling my kids they are going to send me to the "looney bin!" My ten year old finally asked the other day, "Mom, what is the looney bin?" Now they know. I think Spring Shadows Glen sounds much better! Thank you for sharing this. I have a feeling I will be needing this for my daughter in the next year! Hilarious! L&B did the same but also like to finger paint with you know what. We used sleep sacks put on backward over their Pjs. Crazy kids! My bro & SIL have been very blessed that at 3.5 yo, my niece 1) has never tried to get out of her crib, 2) has never tried to take her clothes off. If they ever have a sibling for her, I expect he/she not to be nearly as "easy"!! I love the picture of AB and Jackson...her smile is priceless and he is growing up so fast! You should let Kelly Stamps know about these. She is having a hard time with Harper. I read on someone's blog about the 'duct tape belt'. As a mother of older children and a childcare provider of 24 years, I know how frustrating it is when they decide to remove their clothes. And I also have had to dealt with 'finger painting'. Good luck. That last pic...oh the cuteness. Bless your mama's heart indeed! Those are wonderful! I wish I would have had them why my kiddos were still in diapers! The three year old I have watched since she was an itty bitty did this too! 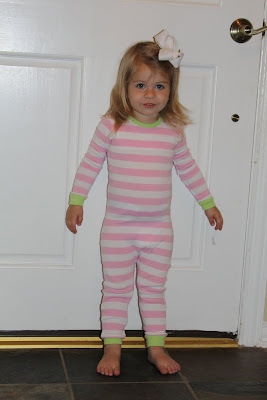 Finally, we just bought some inexpensive footie pj's and cut the feet out then put them on backwards! So glad that your problem was solved. When my niece did this exact same thing my sister in law just took footed pajamas, cut the feet off, and put them on her backwards. Same idea, just maybe not quite as cute. My little one just likes to push his diaper down halfway and run around the house like that. He's working his way to the inevitable. My husband says that he's afraid that he's going to come home one day and find me crouched in a corner, rocking back and forth, and chanting, "Humanahumanahumana..." So I guess I don't need to threaten to go to the loony bin because, some days, I'm on my way there. Oh, my goodness! I wish I'd have known about these when my kids were little (if they even had them). But I have to admit the thing in this post that gave me such joy, was the fact that your mom actually told you that you were driving her crazy! I was beginning to think I could never measure up and my kids would have to check themselves into that place (I already forgot the name). I just tell my kids they're driving me insane and if they don't stop I'll have to be hospitalized! Of course, the scary thing about me saying it is it's actually happened! Of course, they were too little to remember! Well, actually, I only had one and he was too little to remember. He was a toddler. One had not even been thought of yet (at least not by us) and the other one...well, she actually went with me, cause she was in my tummy :) Maybe that's why it's usually her that driving me nuts? She's already been to the psych ward! That is hilarious! It's always good to see I am not the only one having "I will go cuckoo today" moments! 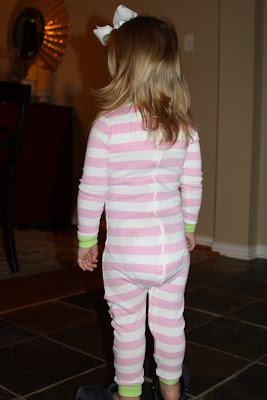 Someone just referred me to this blog for these jammies...Our little Brooklynn has escaped from pajamas safety-pinned at the top through the zipper, pajamas on backwards, diapers with duct tape, onesies...I feel like I'm out of options. I will be ordering a pair asap...I've had one too many run ins with "diaper crayons". Thank you. If anything it helps to know I'm not alone. Amanda, I laughed out loud several times reading this! You are hilarious! Love the story about Spring Shadows Glen! Your AB is adorbs, for sure.